Mr. Oktoberfest and I fly out to Munich tomorrow to begin our honeymoon, so how did we spend the night? Did we do laundry? Did we pack? Did we spend time with our mothers? No. We spent the evening with our friends from the Schnitzel Platz at the fifth annual Glendale Heights Oktoberfest! It’s no secret that the Glendale Heights Oktoberfest is our favorite local ‘fest, so when we found out that it opened the day before we leave for our trip, the decision was made. When we rolled into Camera Park, we were delighted to find that the parking lot was already packed. We slid the car into the easily accessible overflow parking area and geared up for an excellent night of German fun. We couldn’t wait to get inside. Admission for the Glendale Heights Oktoberfest is $5 for adults after 4 p.m., and free for humans 16-years-old and under. Either way, it’s a bargain. Once you add in free parking, it’s practically a steal. As much as we love Alpine Thunder, who were already playing as we entered the tent, the real star of the Glendale Heights Oktoberfest is the food. Normally, when we enter the ‘fest grounds, all I want is to get my hands on a Bier. Tonight, however, my thoughts played to the tune of the old Chicken Tonight jingle: “I feel like schnitzel tonight, like schnitzel tonight.” Once we approached the food station, we ended up with much more. Don’t get me wrong, the schnitzel sandwich with grilled onions and potato salad ($8) is a quality choice. I may or may not have dreams about it tonight. But the stellar sides at the Glendale Heights Oktoberfest deserve some attention, too. Disclaimer: I don’t like sauerkraut. I never order it. I normally wouldn’t touch it. 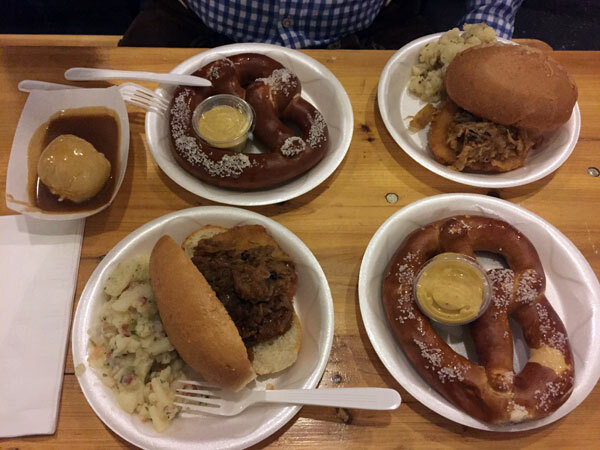 I don’t even eat it when we serve it at our own Backyard Oktoberfest. But when we’re talking about Chef Wolfgang’s fried sauerkraut balls ($8), I literally cannot get enough. They pair perfectly with the Oktoberfest Bier, as well. Even now as I write this, stuffed with schnitzel, potato salad, bread dumpling with gravy ($5), and pretzels ($6), I want more. We often tell our friends that the Glendale Heights Oktoberfest is one of the most authentic around. I have not yet been to Oktoberfest in Munich, so I cannot personally attest to that yet. But I do know that when I’m there this weekend, I will miss our friends in Glendale Heights and crave the schnitzel and other German delicacies they do so well. The Glendale Heights Oktoberfest is open through September 25. You should go. And have some sauerkraut balls for me.